I think we can agree that emotional shopping is not a healthy habit. That said, I was feeling a bit low and now I cannot deny the unicorns-and-rainbow feelings I currently have following an afternoon of browsing for sewing inspiration. Late Friday night I made a decision to abandon my efforts to complete a Mulan costume in time for Emerald City Comic Con (March 28-30). Between work, wedding planning, and DIY-ing I was feeling pressed for time and I’ve felt physically very tense for the past week or two. A week ago I was dealt a 30-hour headache and my neck and back felt like one tight knot. The Wardrobe Architect series from the Coletterie blog has been insightful and left me with a long wardrobe “wish list.” But in terms of deadlines, I wasn’t allowing myself to get distracted by regular clothes because I needed to finish Mulan by the end of March…and then a wedding dress by June. Mulan’s costume only has three components, but after 3 years of planning to make this costume, I did not want to rush any part of it. As soon as I told Greg that I was going to skip Mulan, I felt a weight lift and within 48 hours the joy of sewing had returned. 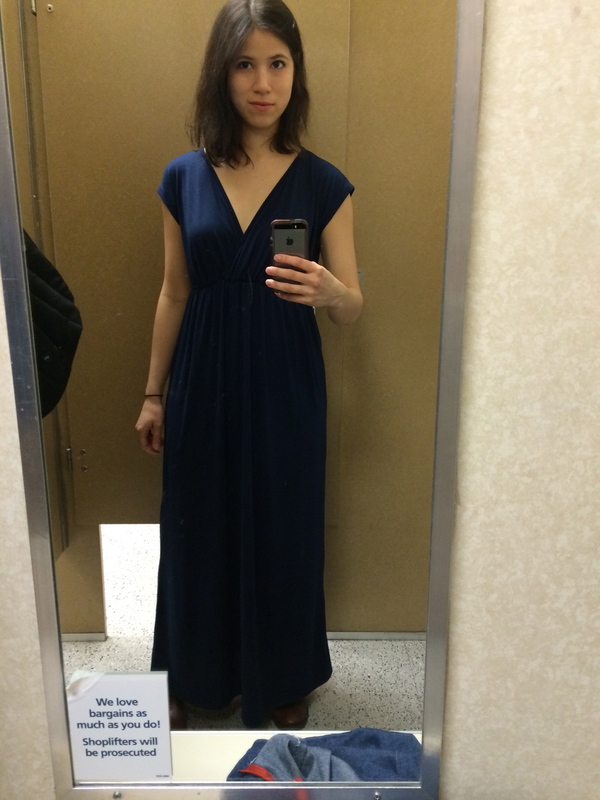 Following a Sunday lunch meeting, I stopped by Ross and Marshall’s to try on maxi dresses. It seems everyone has one or an online tutorial on how to make one, and I can’t deny the convenience of a soft jersey dress that layers easily. I just had NO idea what style to go with. One of my first Wardrobe Architect epiphanies was about what clothing silhouettes I gravitate toward and what looks best on me. 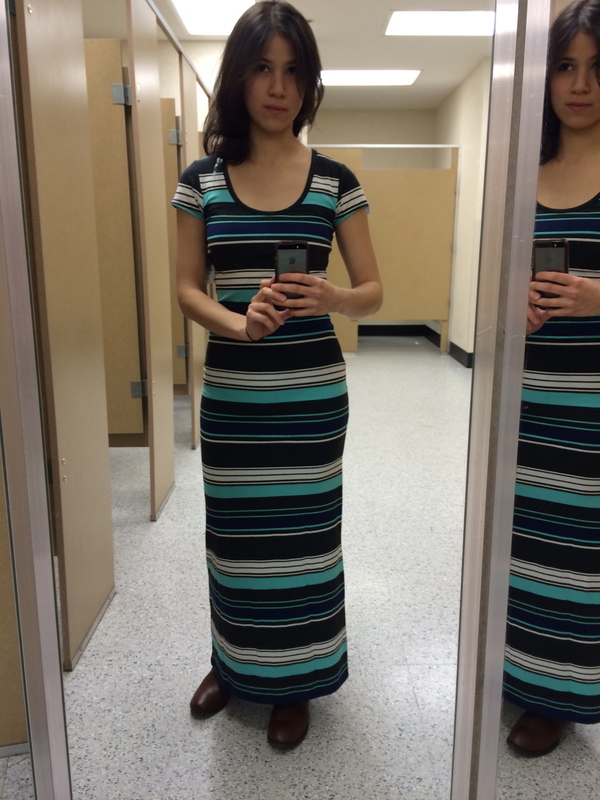 I hoped that at least ONE maxi dress would help me decide which online tutorial to use. It fits, it’s cute. But it also looks very young and has a 1990’s vibe to it. I wouldn’t feel comfortable wearing something this clingy to work. However, a shorter version fits with one of my preferred silhouettes. 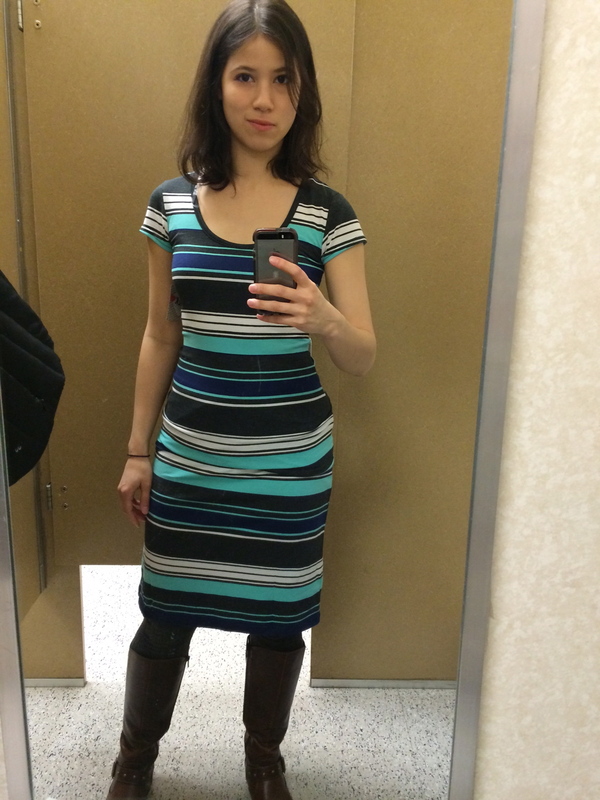 Terry gave me a medium weight purple interlock that would be great for a knee-length dress like this. WINNER! This crossed bodice and elastic waist make for a very flowy dress, but one that still defines my waist. I like these kind of “sleeve”. I have broad shoulders that don’t often fit set-in sleeves. 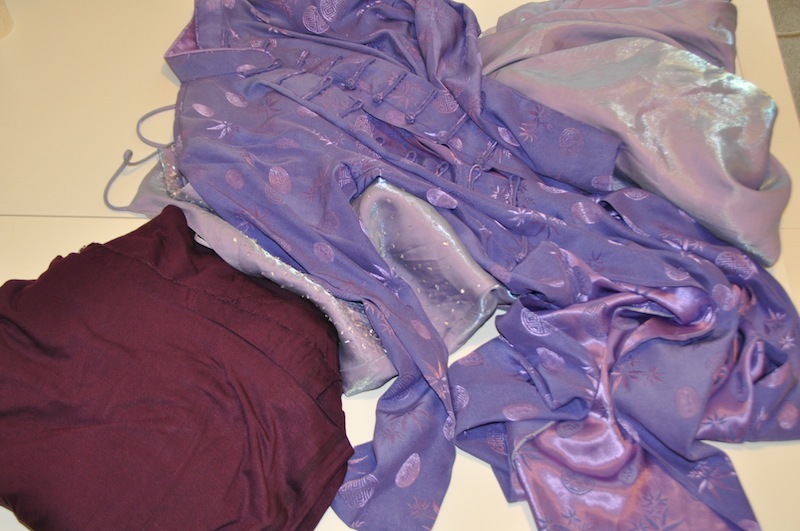 Wait, what’s this shiny purple fabric? Oh yeah. 🙂 Even though Value Village had no maxi dresses, I did stumble upon a Chinese-inspired robe that immediately made me think of Inara Sera from Firefly/Serenity. I still want to make a new costume for Emerald City, and I think I can make a dress that Inara might wear, rather than try to match a specific outfit from the show. Greg will be cosplaying as Malcolm Reynolds at ECCC and his presence would give an Inara-inspired dress some context. 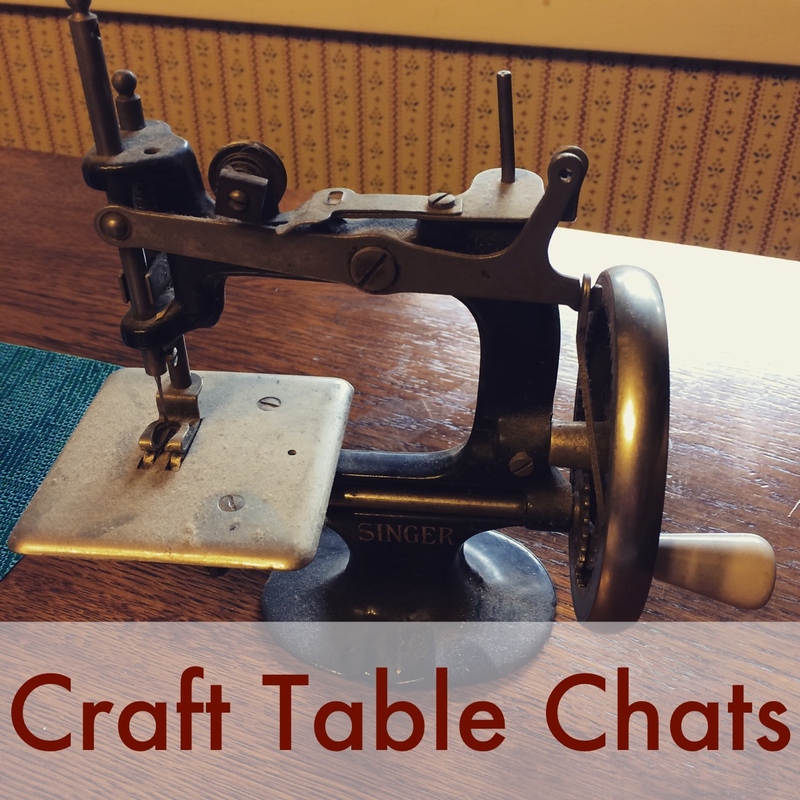 It feels good to feel excited about sewing instead of overwhelmed. I’ll write more about the maxi dress and the Inara costume later this week. You can also follow my Wardrobe Architect process on Pinterest. I think your plan to ditch the self-imposed project was a good one. 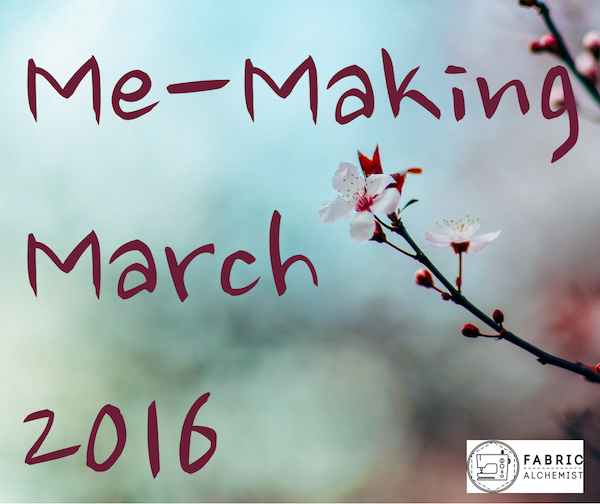 If you aren’t having fun when sewing, it’s time to stop and switch gears. I do enjoy the technical challenges of creating a replica, but I love the creativity that goes into the steampunk My Little Ponies or gender-bent versions of characters that I see at each convention. There are also plenty of people who show up in gorgeous costumes that are their D&D or WoW characters or no specific character at all. I hope that these two dress projects help reset my creativity juices. One day when you get Mulan done (and I totally hear you on the not wanting to rush it! ), let’s find an occasion to Mulan around together!